Round 2 of the Team Durango Winter Series took place on Sunday 28th November. The UK had been hit by bitterly cold temperatures and the Ardent Racing crew had been working on keeping the racers warm. The pits had been insulated and the gas burners were fired up to provide warmth. We would like to thank the 110 competitors that attended despite the conditions outside. The track for this round of the series featured much less high grip carpet than round 1. The carpet of the touring car track had been rolled away leaving the wooden boarding as the racing surface for the majority of the track. This surface gave a medium level of grip, allowing the cars to slide around a little. Other surfaces were used, there was a carpet section at the start of the straight and the huge table top jump in front of the rostrum was also carpeted. There was a slippy surfaced hairpin on the corner before the wall ride. The table top was a new feature this time and saw the cars getting some big air time. As well as this feature there were four smaller jumps around the track. This was the first round of the series where the dBoots Terrabyte tyre has been available. It would be interesting to see how these tyres would compare against the competition. The format of this meeting was to be the ‘normal’ format for off road meeting in the UK – 4 rounds of round-by-round qualifying with your best 2 scores to count, followed by a single final. Qualifying was dominated by Team Durango driver Nathan Walters. 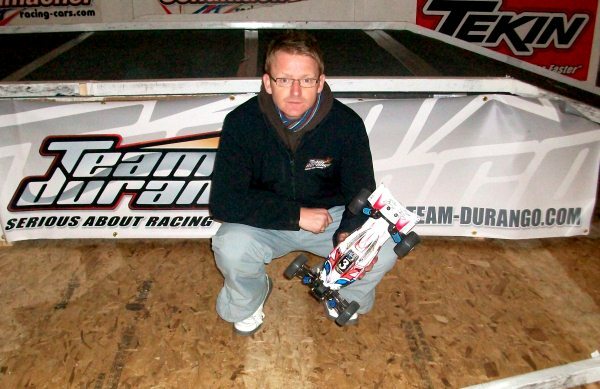 Nathan took the TQ position for all 4 rounds of qualifying showing that the Team Durango DEX410 and dBoots tyres were the class of the field. Second and third positions were tied on points and had to be separated on fastest time. This went to Keith Robertson from Team Durango’s Adam Skelding who was also showing the raw speed of the DEX410 and dBoots tyres. The start of the A final saw cars fighting for track position around the first corner. A collision put pole-sitter Nathan back into the pack. Adam Skelding had made an awesome start from third on the grid and took the lead. Over the first part of the race Adam pulled out a good lead and was able to keep a good gap to the rest of the pack. Nathan was on a charge and had got into second place. Could he reel in Adam? Following hotly on Nathans heels was Greg Williams from 9th on the grid. A small error by Adam saw Nathan and Greg reduce the gap. Then a rare error from Nathan allowed Greg past into second place. A great result for the Team Durango DEX410 and for dBoots Terrabyte tyres. Adam ran one set of dBoots Terrabyte tyres all day without a drop off in performance, showing that they give excellent performance and have a good wear rate. dBoots tyres will be available at the next round of the series. Round 3 of the Team Durango Winter Series will be held on the 19th December 2010. The Ardent crew tell us that the track will be similar to what they have planned for the Petit RC race in January, and will feature an even split of carpet and wooden floor.